Jamestown, New York is the birthplace of Lucille Ball. Betcha’ didn’t know that, huh? Well, neither did I. 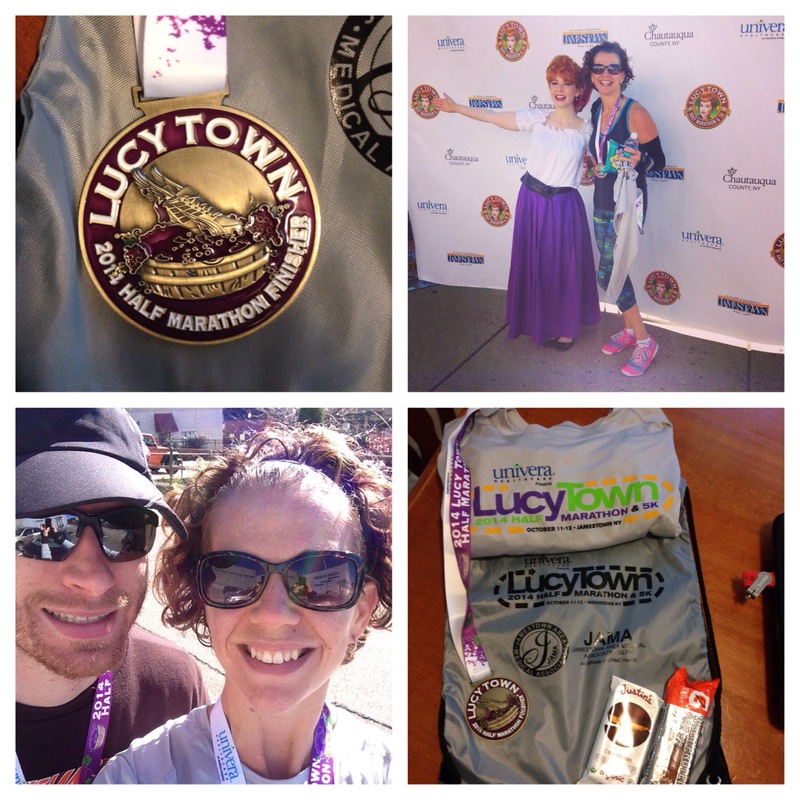 When I received an email from the Lucy Town organizers asking if I’d run the race and blog about my experience, I was excited to be able to say yes and add such a unique experience to my race calendar. Phil and I planned to go up to Jamestown for the weekend and stay nearby. He was originally planning to cheer me on, but when the local half marathon that he was planning to run was canceled, he signed up for Lucy Town so we could run it together. I’m so happy that he did and I’m so happy that we found this race, or honestly, that it found us. So, here’s the Lesson Learned/Nailed It version of my race recap. Phil and I headed to the expo in Jamestown and grabbed our race packets with zero waiting. Unique fact – the expo is held on an ice rink covered in plastic tiles to walk on. It was the most original setting that I’ve ever picked up a packet from. Since it was near 4pm and we had skipped lunch, we headed out for an early bird dinner at The Pub. Thank goodness for Cleveland running friends – fellow #CLE runner Chelsea recommended this restaurant and it did not let us down. We had delicious pasta, Italian bread and (when in Rome) Southern Tier Expressway beer. We headed back to the cottage, stopped for some food supplies on the way home and settled in to bed super early. Lesson Learned: We could have packed more of our own food. I was uncertain of what the kitchen would be like in our rental, but it was fully outfitted. We could have saved money and cooked for ourselves. Nailed It: The VRBO rental right off the highway. Zero stress on finding our location and an easy drive to the race. Morning: We woke up early and prepped breakfast and coffee and had plenty of time to get out the door. The only issue? The temperature. 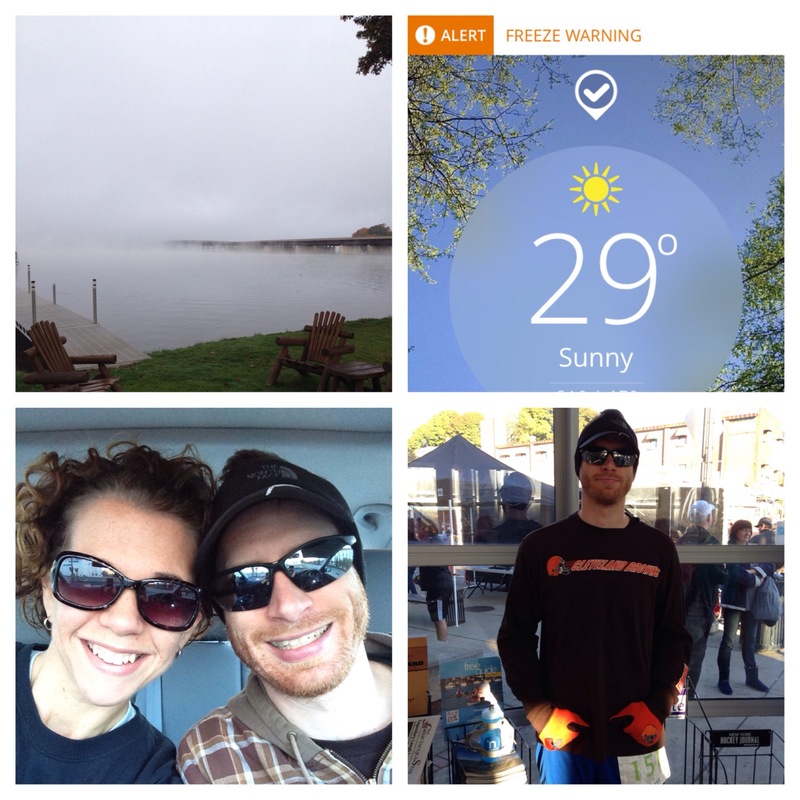 It was a brisk 29 degrees as we were preparing for the race. I expected temps closer to 40 and had to over-debate what to wear. I ended up going with my original outfit, added the race tech shirt over it (cringe!) and took a throw away shirt to wear for most of the morning. Phil did a great job layering up. We headed out to Jamestown around 8am for a welcome 9am start time. Lesson Learned: I’ll always be debating what to wear in the fall. I’ve yet to master the science. Nailed It: Compression sleeves on my arms – they are the winner again. Not exactly gloves, but thumb holes give me some hand warmth. Keep the rest of my arms nice and warm. I highly recommend Zensah sleeves! Phil made sure to represent his home team while out of state! Start: A small town race is the best for an easy start. Phil and I found free parking about 50 feet from the starting line and had time to head in to the arena that was being used as a gathering area and use the restroom. We headed back to the car to stay extra warm and had no stress or worry about getting to the start on time. The crowd was just over 300 runners and we enjoyed chatting with some fellow Clevelanders before we got going. We came together for the national anthem and race announcements and walked to the starting line as a group. A huge difference over fighting for parking, waiting in long port-a-potty lines and stressing about being in the right corral. Lesson Learned: Nothing, except perhaps racing in some more small town races in the future! Nailed It: Timing. No rushing, no worry. A great race morning. First Half: Phil and I started the race strong and enjoyed the first mile loop through the city, which included a large uphill near the end of mile 1. 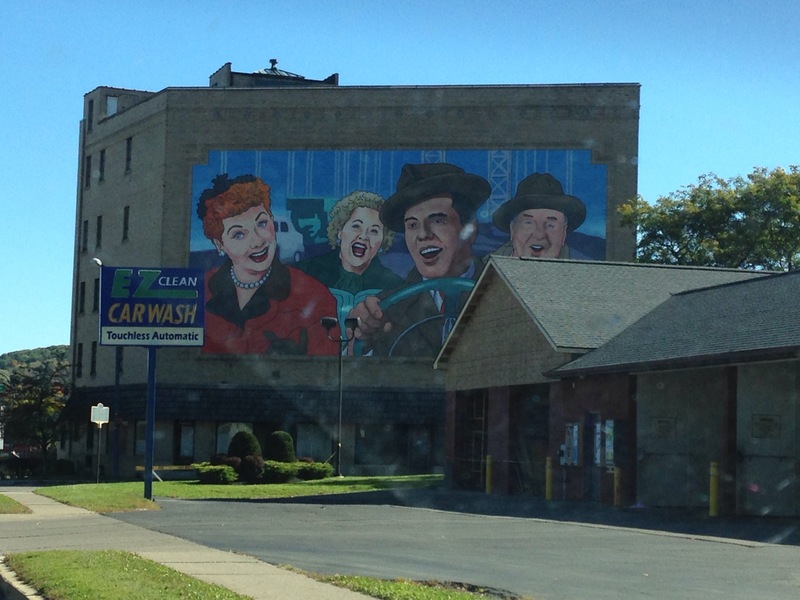 You pass the Lucille Ball mural (pictured below) and face the only major incline of the race during this first portion. The race then flattens out as it heads out in to the suburb of Lakewood for the first half. Aid stations are approximately every two miles and are stocked with water and Gatorade, as well as great volunteers who cheered and offered support for the entire race. 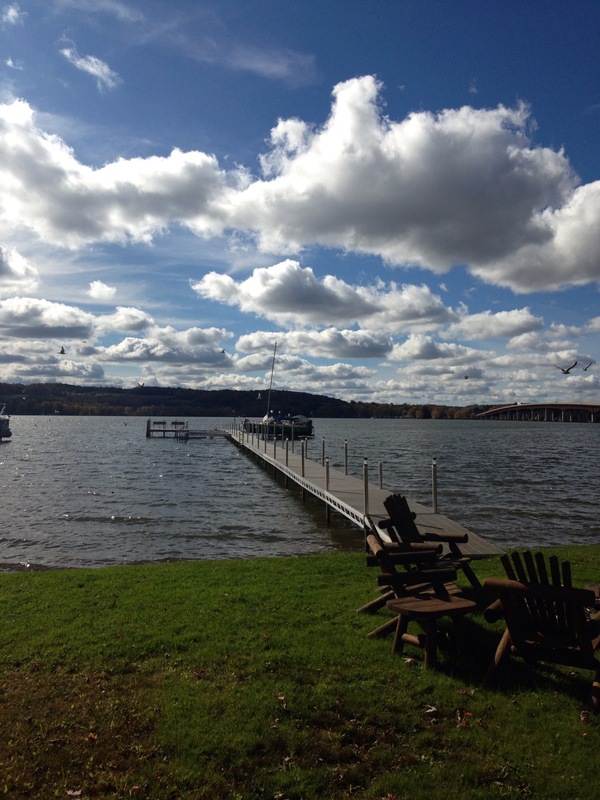 There is a stretch during the first few miles that is mostly industrial, but once you break out of that, you enjoy views of the lake, the surrounding wetlands and homes that line the shore. The fall atmosphere is breathtaking. Many local families came out to cheer, several shouting “Go Browns!” after seeing Phil’s shirt. Phil and I felt great through the first half and were keeping a steady sub-10 minute/mile pace. While neither of us knew if we had a PR as a possibility, we kept it in our sights. Lesson Learned: I could have survived without throwaway shirt. I ditched it at mile one, far earlier than I thought I would be ready to be without it. Nailed It: Pace. We were steady as a rock for those first 6.5 miles. Second Half: After looping through the turnaround, we kept an even pace through about mile 9.5. At this point, Phil and I agreed we could have used another round of fueling, but neither of us had packed any. We both agreed that the fuel would have been good for a mental boost, but that our bodies were not feeling like we were carb-deficient. The main issue at this point became legs – Phil’s knee was locking up on him (a nagging injury that pops up sometimes) and my right hip/IT Band was starting to get irritated. We were still holding strong with our pace through mile 10, but decided to re-evaluate our PR goal at this point. We added some walking breaks and agreed to just fight through the last 5K together. The course returned to the industrial zone at this point, making focus important. Phil tried to send me ahead, but I wanted to finish the race together, regardless of our time. We walked the final uphill and hit the last half mile running. Final time = 2:19. Not our PR, but not my worst time either. Lesson Learned: Extra fuel might have been nice, but we survived without it. Should have checked the race course/info to find out that they wouldn’t be offering any. Nailed It: Sticking it out through the tough spots to finish strong. Proud of us! The finish line of this race was wonderful – we had our name & hometown called out as we crossed the finish and then got to enjoy Tim Horton’s bagels, fruit, chips, water and hot dogs & veggie burgers being cooked by a local high school hockey team. Live music kept the crowd entertained and feeling lively. We collected our awesome finisher medals, got my photo snapped with a Lucy lookalike and headed home. Check out the great swag we both picked up! We’ll be back to the Lucy race in the future – we missed out on the events that took place on Saturday, including a World Record Grape Stomp and a comedy show with Bob Newhart. 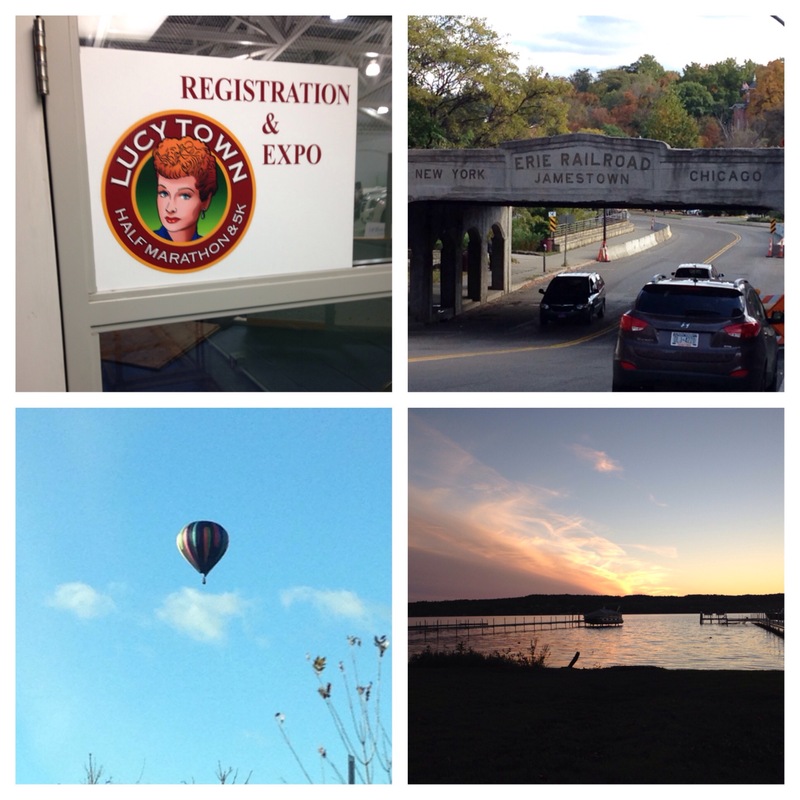 Thank you to the Lucy Town organizers for an amazing experience!